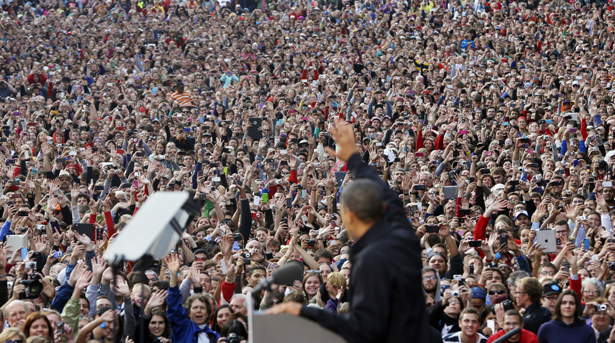 In a second Obama term, we must organize to win a new social contract for a new economy. In Mitt Romney’s America, 47 percent of the people live on government handouts, incapable of taking responsibility for their lives. In the real America, ordinary people are working harder than ever for less and less. Work once held a promise: it would allow workers to sustain their families, contribute to a community, and realize their full potential as human beings. In today’s economy, this promise no longer holds. Workers know something about the economy that neither party has faced up to: work in America has changed, fundamentally and forever. First, the nature of employment has changed. Millions of people don’t work for the ultimate beneficiary of their labor, but for subcontractors or suppliers. Millions more are temporary, part-time or “self-employed.” A third of the US workforce—42.6 million workers—is now contingent. Tens of millions of workers no longer know who their real boss is. Second, the nature of unemployment has shifted. Workers used to be employed for long periods; unemployment was short-term. Workers now face long-term unemployment interrupted by intermittent employment. Forty percent of the unemployed have been jobless for twenty-seven weeks. Unemployment is twice as high for African-Americans as for whites, and one and a half times as high for Latinos. Third, the US workforce itself has changed. Today’s workforce isn’t just middle-aged white men: it’s women (49 percent), people of color, undocumented immigrants, young workers, baby boomers forced to delay retirement and guest workers. US companies now source workers from all over the globe, importing cheap labor for local jobs. And where there is prospective job growth, it’s overwhelmingly in low-wage sectors like service and retail. Ana Rosa Diaz can tell you what the US workplace will look like at the end of this road. Jobless in Mexico, Ana was recruited to come to the United States as a guest worker. She peeled crawfish for a Walmart supplier in Louisiana that subjected her and her fellow workers to forced labor: they were compelled to work up to twenty-four-hour shifts with no overtime pay and were also locked in the plant to prevent breaks. When the workers spoke up, the boss threatened violence against their families. On our current path, we all end up as guest workers: trapped in an economy of temporary, intermittent work, subcontracted, migratory, struggling with debt rather than building wealth, sourced into labor supply chains rather than climbing career ladders. We need to use a second Obama term to create the conditions for winning a new social contract for a new economy. That means creating new forms of collective bargaining that let contingent workers and service workers bargain directly with the corporate actors that set the conditions of their jobs and their lives. It also means winning a vastly expanded role for the state in protecting all workers, including a new social safety net that addresses the rise of contingent work and long-term unemployment. That will take more than a president; it’ll take a social movement. Because what’s really at stake isn’t the next four years—it’s the next forty.